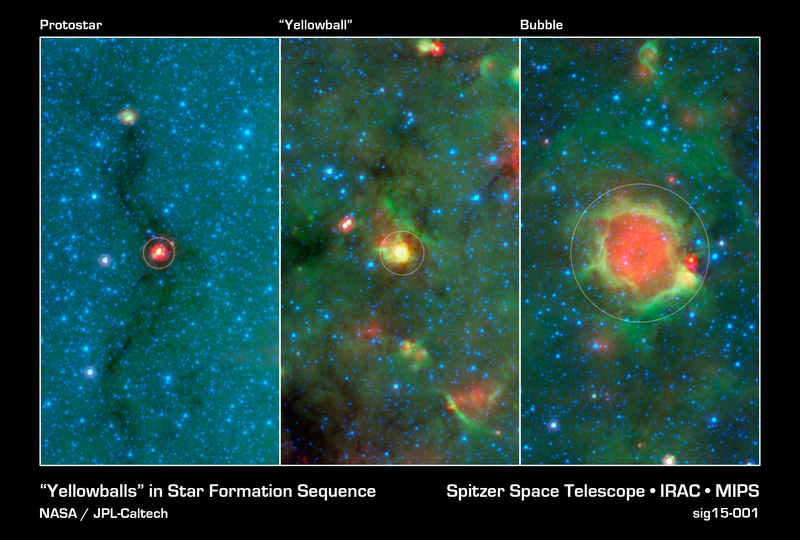 There is a new Milky Way Project paper in the news today, concerning the #yellowballs that were found by Milky Way Project volunteers. This new paper is the fourth from the Milky Way Project, and adds to the Zooniverse’s growing list of 80+ publications made possible thanks to our amazing volunteers. You can see the complete set at zooniverse.org/publications. The full list of volutneers who helped tag the yellowballs is shown below. Each and everyone one of you made a valuable contribution to this paper. Thank you to everyone who helped in this search! KhalilaRedBird, lpspieler, greginak, LarryW, chelseanr, broomrider1970, Dealylama, Cruuux, Mirsathia, suelaine, sdewitt, stukii, kmasterdo, PattyD, HeadAroundU, Fezman92, Jakobswede, Jk478B27Ds395, Kerry_Wallis, iacomo, Ken Koester, ttfnrob, jules, Falconet, Caidoz13, Starsheriff, ascil, simonron, tyna_anna, gwolfchase, Greendragon00, Ranchi, kirbyjp, githensd, katieofoz, harbinjer, ycaruth1, embo, echong, Feylin, stock_footage, zookeeper, joke slayer, karvidsson, Furiat, Tyler Reynolds, Manjingos, cathcollins, legoeeyore, GabyB, eshafto, mtparrish, 59Vespa, amatire, TheScribblery, pschmal, Helice, norfolkharryuk, WilB, jamesw40k, koenvisser, dragonjools, Nocterror, nunyaB, hansbe, meheler, Cahethel, Alice, stellar190, mabbenson, Embyrr922, gnome_king, jumpjet2k, tchan, yoman93, and Loulouuse. These new data come from the GLIMPSE 2 survey – a comprehensive survey of the middle-part of our galaxy in the infrared. We’re also going to be adding in some of the GLIMPSE 1 data (from the old version of the Milky Way Project) back into the site but with the new colour stretch. We’re doing to that to check the system works, but also because new features and structures will be visible with the change in data and colour palette. We’re still crunching the data from the new classifications, but we’ve been able to extract lists of galaxies, EGOs and star clusters that you have found. We hope to share those with you soon. So hop on over the milkywayproject.org and let’s add another 600,000 classifications and continue mapping the galaxy. The Milky Way Project (MWP) is complete. It took about three years and 50,000 volunteers have trawled all our images multiple times and drawn more than 1,000,000 bubbles and several million other objects, including star clusters, green knots, and galaxies. We have produced several papers already and more are on the way. It’s been a huge success but: there’s even more data! And so it is with glee that we announce the brand new Milky Way Project! It’s got more data, more objects to find, and it’s even more gorgeous. The latest Zooniverse technology and design is being brought to bear on this big data problem. We are using our newest features to retire images with nothing in them (as determined by the volunteers of course) and to give more screen time to those parts of the galaxy where there are lots of pillars, bubbles and clusters – as well as other things. We’re marking more objects – bow shocks, pillars, EGOs – and getting rid of some older ones that either aren’t visible in the new data or weren’t as scientifically useful as we’d hoped (specifically: red fuzzies and green knots). We’ve also upgraded to the newest version of Talk, and have kept all your original comments so you can still see the previous data and the objects that were found there. The new Milky Way Project is teeming with more galaxies, stars clusters and unknown objects than the original MWP. It’s very exciting! 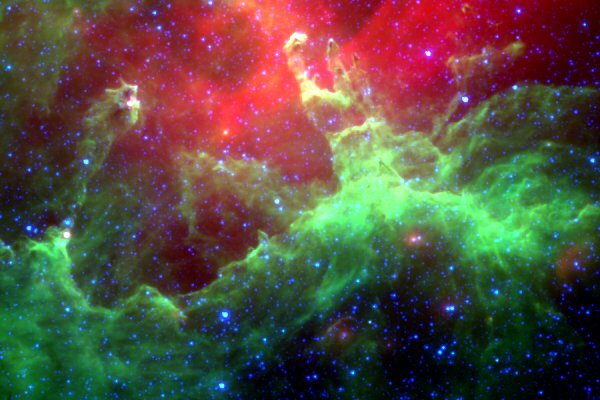 There are tens of thousands of images from the Spitzer Space Telescope to look through. By telling us what you see in this infrared data, we can better understand how stars form. Dive in now and start classifying at www.milkywayproject.org – we need your help to map and measure our galaxy. I’ve been diving into the bubbles database recently and ended up creating cutouts of all 3,744 large bubbles from the DR1 data release. From there it was an easy enough job to create this new Milky Way Project poster. It uses all 3,744 bubbles at least once (several are used more than once). I’m currently working on three new Milky Way Project papers and will be blogging about them in the next weeks and months. A great article from JPL’s Spitzer site, about GLIMPSE and with a lovely link to the Milky Way Project. I’ve spent much of the past two weeks messing about with different ways to reduce down over 200,000 bubbles (now almost 220,000) into a sensible catalogue. This gets very messy so I will try and explain what I’ve been up to in stages. This is a process called data reduction and for a citizen science, crowd-sourced project like the MWP, it can get complicated. I thought it may interested some of you to see where we currently are in the process of turning your clicks into results. The key part of the data reduction problem is that we have a very large set of data – the massive number of bubbles that have been drawn – and need to decide which among them are ‘similar’ to each other. We need to keep some flexibility of our definition of similarity because right now, I’m not sure what ‘similar’ means. Essentially, bubbles are ‘similar’ when two people draw a similarly sized bubble in a similar location. This is something that sounds remarkably easy to say but was hard to do well in code. Comparing 200,000 bubbles to each other is obviously computationally intensive. 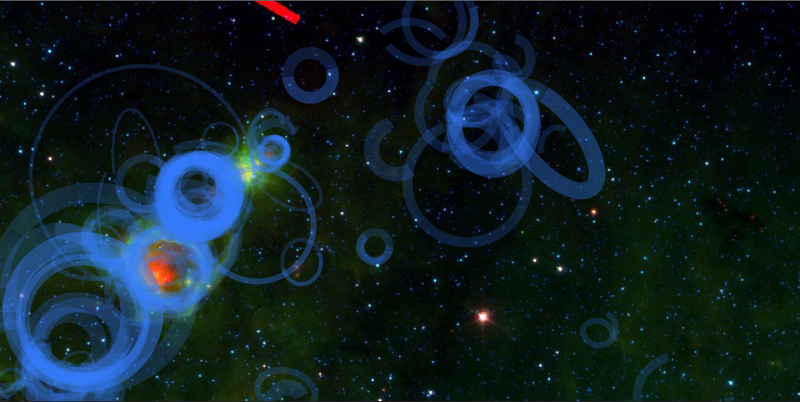 In the end I decided that since the size of bubbles was a consideration then I would move across the galaxy, looking on ever-decreasing orders of size. To do this I split the galaxy into 2×2 degree boxes and take each box in turn. In each box I see if there are bubbles here that are of the order of the size of the box (meaning they have a maximum diameter that is between a half- and a whole-box). If there are bubbles on that scale I run a clustering algorithm and pick out groups of these bubbles with central positions clustered to within one quarter of the box size. 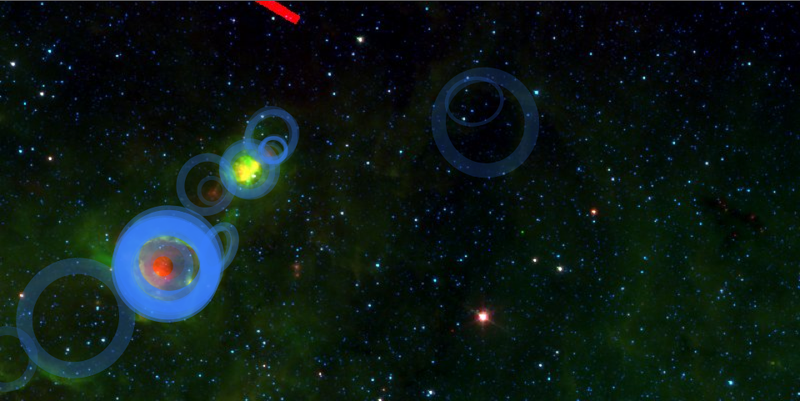 If a cluster is found, those bubbles are then saved and removed from the whole list. I then divide the box into four and repeat until no bubble are found. 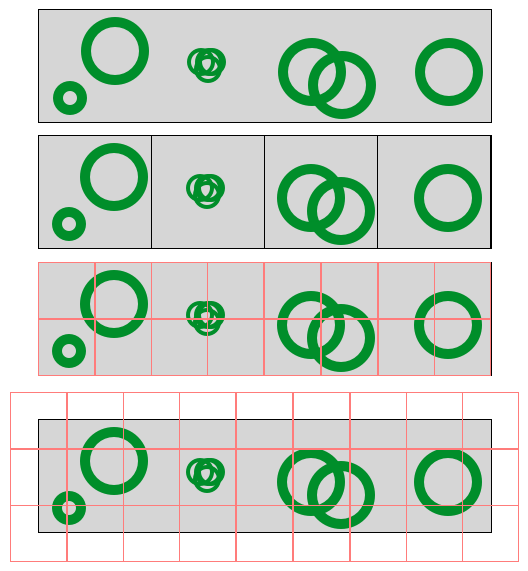 This method means that when a box contains no bubbles, we need not continue down in size scale, but when it does contain bubbles we always split and inspect the four child boxes. In this way we move through the galaxy, in ever-decreasing boxes, but in a fairly efficient manner. We also have to perform the same analysis with an offset grid. This is exactly the same but making sure we catch bubbles that had fallen on the borders of boxes. Once we have passed across the galaxy on all size scales, we need to make sure we’ve cleaned up the duplicates created by the offset grid. We do this by considering our newly created list of ‘clean’ bubbles and running through them in order of size. 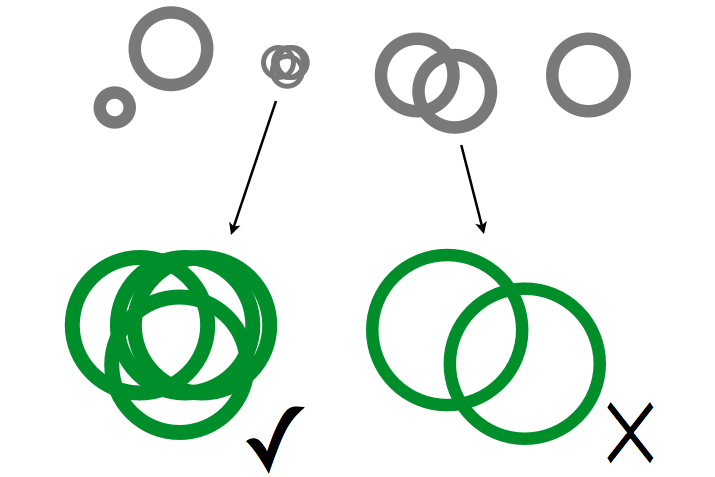 When we find bubbles of a similar size and location they are combined, according to the number of users that drew that bubble. This can be done more easily now that there are far fewer bubbles (in my tests we have dropped to around 5% of the initial number by this stage). My initial run only looked at bubbles in the longitude range 0-30 degrees. Below are three images, showing one image from the MWP set (one of my favourites as lots of people see it differently). You can the the image, as it is shown to MWP users. Below that you see, overlaid in blue, the original bubbles as drawn by the users. In the third image you can see the same, but this time displaying the ‘cleaned’ results. In the original set the bubbles all have the same opacity, such that when they pile up you can see the similarities. The cleaned set gives the bubbles opacities according to their scores (think more opaque bubbles mean more users drew them). It should be noted that the cleaned image does not yet display arcs, but rather always shows an entire ellipse. This is because I am not yet including the bubble cut-outs (which you can make out in the middle image) in the data reduction. These will be included at a later time. You can see that I’m still getting some duplication at the end of the process – I may need to sweep across the final catalogue looking for similar bubbles until I reach a convergence when all bubbles are ‘unique’. I have been experimenting with this with mixed results but will continue my efforts. If you’re still reading, I look forward to reading your comments. As I continue to make adjustments and progress with this reduction, I shall blog the results again. Many members of the science team are also having a go at this problem and so the final result may be quite different in the end as we improve things. I hope that this is an interesting insight into some of what goes on behind the scenes of the MWP. Star formation is one of the most important processes at work in the cosmos. The atoms that make up our planet and ourselves were made in the centres of stars, billions of year ago. To study star formation is to begin to understand the origin and make-up of the Galaxy and the Universe at large. The mass distribution of stars and the rate at which they are born determines the nature and evolution of galaxies, such as our own Milky Way Galaxy. To understand many aspects of galaxy evolution, planet formation and cosmology, an understanding of star formation is required. It is one of the most fundamental mechanisms at work in the Universe. Here at Zooniverse HQ we’ve been looking at how to get involved with the study of star formation for a while now. This is, in no small part, due to the fact that three of us at Zooniverse HQ have a background in star formation research. Chris Lintott, Arfon Smith and myself have all worked in this field and thus have been keen to make this project a reality for some time. Project 9 is going to be the first Zooniverse contribution to the field of star formation. Project 9 is also going to be the first Zooniverse project to crowd-source more than just the science. We’d like to get opinion and feedback from the Zooniverse community as we develop the project. Project 9 will be using data from the Spitzer Space Telescope, one of the most successful science missions ever put in orbit (which took the stunning image of the Andromeda Galaxy seen above). We’ve been working with the people behind the Galactic Legacy Infrared Mid-Plane Survey Extraordinaire (GLIMPSE). We think that you all may be able to help us classify some of the structures seen in this data – but more on that in a future post. Stars form within dark clouds of gas (predominantly hydrogen and helium) and dust (larger molecules that have collected together into grains). They are dark because they absorb visible light. 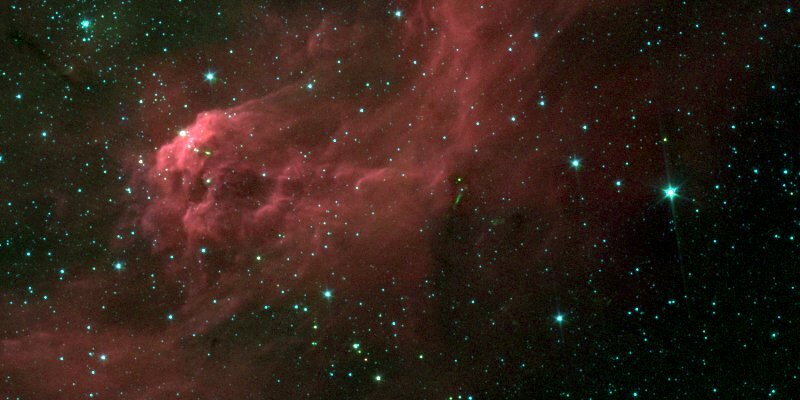 The dust in these star-forming regions absorbs visible light, and reemits it at infrared wavelengths. The result is that if you want to look for stars in the making, you must look in the infrared. The Earth’s atmosphere absorbs infrared light, so to search for star-forming regions you need to use a space-based infrared telescope – like Spitzer. Infrared images of star-forming regions are often beautiful – you can browse a version of the GLIMPSE data via this link. We have been toying with different colour stretches for the GLIMPSE data to use for Project 9. Amongst the plethora of gorgeous images – from just a small part of the sky – I came across a familiar object: the Eagle Nebula (above). I thought this would give you an idea of the sort of images Project 9 will be asking everybody to help dissect and classify. We’re looking forward to getting this project off the ground and will be blogging shortly with more details.